Ask pretty much anyone – whether terrorists, politicians (of all camps), dinner party guests, or religious leaders – and the one thing that they will say with confidence about the Crusades is that they were a conflict between two diametrically opposed religions: Christianity and Islam – a clash of civilizations. This is a widely-held judgement – but is it correct? The First Crusade (1095-1099) – the massive expedition that marched across Europe and the Middle East to capture Jerusalem – underlines some of the difficulties surrounding this toxic assessment. These became evident during research I conducted for two books: Encountering Islam on the First Crusade and The Field of Blood : The Battle for Aleppo and the Remaking of the Medieval Middle East (forthcoming). Problems become clear from the campaign’s outset. The documents produced by crusaders preparing for the journey, known as charters, only occasionally mention any enemy and concentrate their attention on reaching and conquering Jerusalem. Of course, they knew that achieving this objective would require warfare, but they demonstrated little interest in their enemies’ identity, often labelling them as “pagans” – essentially, “non-Christians”. Jerusalem at this time was steadily moving into the epicenter of contemporary religious culture and it was this goal that galvanized thousands to participate, not the desire to attack an enemy religion. The pope’s military objectives were more mixed. In addition to Jerusalem, Pope Urban II also wanted crusading knights to defend the distant Byzantine Empire against attack – but this aspiration does not seem to have resonated with his audience in the same way as the thought of reaching the Holy Land. By extension, throughout the crusade, the Franks (crusaders) proved both uninformed and uninterested in the Islamic faith (or the “Saracen law” as it was known). They knew “Saracens” to be non-Christians and some were vaguely aware of the division between Sunni and Shia Islam, but rarely more. A few thought, erroneously, that Muslims were polytheists. Even many years after the crusade, one 12th century Western writer, William of Malmesbury, in his Gesta Regum Anglorum , found it necessary to explain that “Saracens” did not practice the same faith as Baltic pagans. In short, Jerusalem, not Islam, was the target and they knew little about this religion. On campaign, the crusaders’ main opponents were the Seljuk Turks. The Turks were originally a largely shamanistic and nomadic people who had migrated from the Central Asian Steppe region to conquer much of the Muslim world during the century preceding the crusade. They had seized Syria and the Holy Land only 20 years previously. By the 1090s, the Turks had begun to convert to Islam but many retained elements of their former beliefs. During the crusade – and in later decades – observers noted that some Turks still (among other things): buried their dead with grave goods, scalped enemies, and conducted colossal drinking parties. All these customs reflected their former traditions and many of these and other practices conflicted with Islamic teaching. So the Turks – the crusaders’ main opponents – were hardly longstanding adherents of Islam but instead were part of the way through a long-term process of religious transition. Then, with the escalating conflict brought about by the crusaders’ advance into Turkish territory, several local peoples rebelled against the Turks. These included many native Muslim communities who wanted to throw off their Turkish overlords. And while some were prepared to fight against the crusaders, many remained neutral and some – especially following the crusade – sought crusader assistance (which the crusaders were prepared to offer). Some Bedouin tribes began to cooperate with the Franks soon after the First Crusade. The crusade’s final act occurred in 1099 with the conquest of Jerusalem from the Fatimids (the Shia Muslim rulers of Egypt), following a hard-fought siege. The city’s fall concluded with a general massacre of its population (around 3,000 people were killed, both Muslims and Jews) that was explicitly described by its perpetrators as an act of religious cleansing. This deed has long been taken as proof of the crusaders’ anti-Islamic hatred. Even so, there are problems with this kind of assessment. The crusaders’ actions in Jerusalem are not mirrored by their behavior towards Muslims elsewhere. They did perpetrate several massacres throughout the crusade. In the Near East these typically occurred when a town refused to surrender to their forces and consequently was taken by storm. Having said this, they were also open on other occasions to cooperative action and treaties with the Near East’s non-Christian powers. Indeed, since 1097 both the Fatimids and the crusaders had been trying to forge a mutually beneficial alliance against the Turks. It was only when these talks collapsed that the crusaders’ initiated their siege on Jerusalem. They also admired many of the enemy leaders and warriors who they encountered, either over the negotiating table or on the field of battle, noting their strengths and virtues. One source, entitled the Gesta Francorum , even suggested that the Turks and Franks might be related to one another. 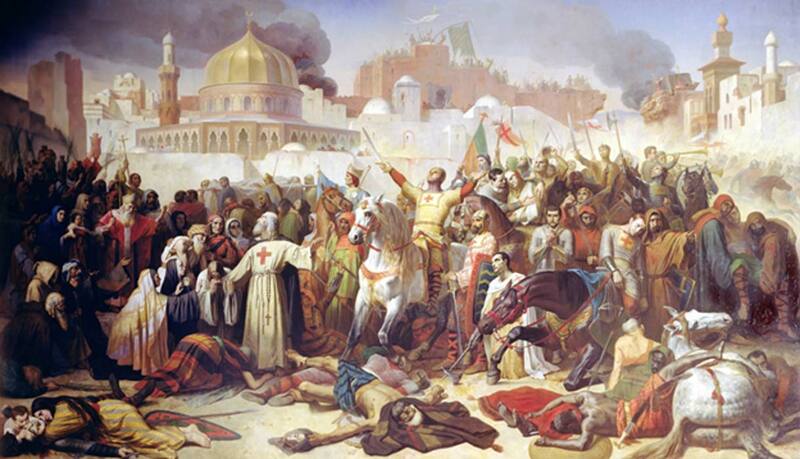 It seems more likely that the massacre was connected more to the crusaders’ ideological ideas surrounding the sanctity of Jerusalem itself than to any specifically anti-Islamic sentiment. According to this script, the crusaders deemed any non-Christian presence within its walls to be spiritually unacceptable, but this did not inhibit cooperation elsewhere. In this way, the crusade was an event of enormous brutality, yet it defies easy classification as a clash of civilizations. The crusaders were not generally interested in Muslims/Islam, aside from the plain fact that they were non-Christians. They were prepared to ally with Muslim communities when it served their purposes and their primary opponents were only partially Islamified. The regions’ local Muslim populace found itself trapped between two conquerors (crusaders and Turks) and forced to take sides, many opting to resist the Turks. 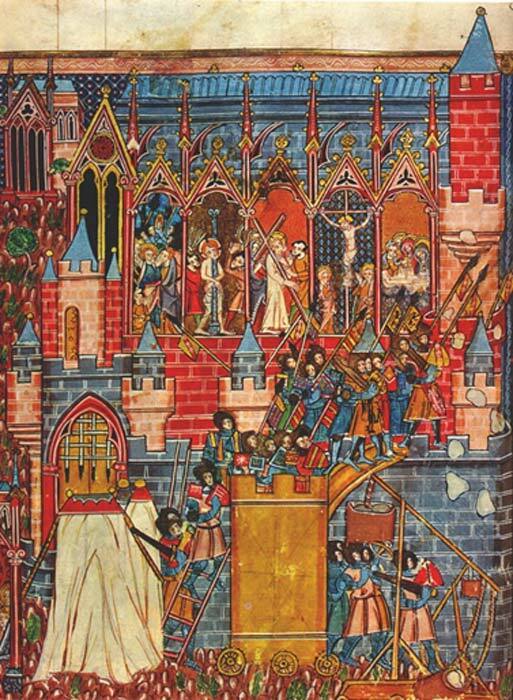 It is fashionable today in some circles to characterize the First Crusade as a “clash of civilizations”, but in the 11th century, the reality was considerably more nuanced. The article ‘ Why the Crusades were not a ‘clash of civilizations ’ by Nicholas Morton was originally published on The Conversation and has been republished under a Creative Commons license. A very important aspect to understanding the Crusades is to understand that the Franks, and Normans for that matter, were actually Jewish. The Jews have always maintained a hatred for Muslims as they are diametrically opposed. One has to remember that prior to Abraham, Jews were actually Muslims, despite the fact that Mohammed was not even born. The reason I state this is that Jews were originally Satanic (patriarchal) until Abraham converted to Lucifer (matriarchal). Do not be offended by these terms as Satan and Lucifer were both tetraploid humans that acted as God. Jews have been Luciferian since Abraham converted and their subsvervient religions (all Persian religions) are also Luciferian. This includes Sikhs, Jains, Hindus, Buddhists, Roman Catholics and some others. This information may be offensive to many, especially those of these aforementioned religions, but it is the truth. It should be well noted that our Hellenistic Western world is Luciferian or matriarchal and this is the New World Order, a civilization run by women, not men. This female tetraploid human, called Lucifer, is the Devil, not Satan. Read more about The Seven Most Deadly Weapons of the Crusades, or Were There Eight?